Considering how far you can go when you're not even paying attention. The last leg to the Bahamas. When I was dropped off at the airport in Oregon, it was 11 p.m., 47 degrees, and drizzling. I was wearing long pants, a sweater, and a wide-brim leather hat, but in my carry-on bag were a pair of shorts, sandals, and a T- shirt. With cool rain dripping off my hat, it seemed beyond reason that when the sun came up I would be in Texas, and by noon I would be in the Bahamas. Standing in line to check in, I wondered what ever happened to the pre-trip buzz. I used to spend days in a giddy state, counting the hours until I would leave. Now, even on departure day, you can hardly tell I'm leaving. I packed for 10 days in the Caribbean in less than an hour. We left Portland at midnight, and I was asleep before the drink cart came by. The pilot had his speaker turned up to about 100 decibels, though, so when he came on to welcome us and say, "Sleep well," he woke everybody up. I've never fully processed the fact that while I sip ginger ale and do some reading, we cross the Rocky Mountains. I catch a few winks, and the Great Plains go by. When I ask for a cup of coffee at 5:30 a.m., I can see the lights of Dallas-Fort Worth. And soon enough we step out of the metal tube and into another airport/mall, just like the one a few hours ago, only this one is thousands of miles away, beside the Gulf of Mexico instead of the Columbia River. Walking across the, ahem, Houston George Bush Airport, I saw ads for Christian magazines, overheard a guy in a cowboy hat say, "one tough sumbitch," and saw a father-son pair wearing identical Astros hats. Other than these details, I might as well have been in Vancouver. And this: At 6 a.m. in April, Houston was 74 degrees. I'm always reminded of an NPR story, years ago, about a 90-year- old woman who flew from San Diego to St. Louis. This was newsworthy because it was the first time she had been back since going out West in a covered wagon in the 1890s. It took her four months at age 5, four hours at age 90. The technology of transportation is staggering, but I think something has been lost. Along with telephones and e-mail, the airplane is eliminating the spaces that exist between us. That has advantages, of course, but the spaces between are, in many cases, definitive of the journey. Somehow getting out West without even seeing the mountains doesn't seem like going out West. One should reach Texas by crossing vast, sun-baked plains, not while sipping and reading and trying to sleep. Back into the metal tube, a bad breakfast in a box, and "to your left is the mouth of the Mississippi River." Most people didn't even look up from their newspapers or laptops. Two hours later we disembarked into another mall, this one apparently in Fort Lauderdale. Everybody was in shorts and flower shirts, showing off either their brand-new tans or their pasty- white Northern winter skin. My flight was in one of those wonderful six-gate waiting areas, where at any given moment two announcements are being made and three ticket agents are being yelled at. The whole place was filled with people from Boston, New York, Hartford, and Philadelphia -- cities where, to judge from their ambassadors in Florida, no one is ever happy. I overheard stories of previous airline incompetence, interrupted by spouses arguing pointless details. "No, Frank, that was in '92, not '93, and it was Joanie who picked us up at La Guardia, not Francine." An hour before departure time, with no agent at our desk, two dozen people stood in line to check in. Everybody was in a nervous rush to get there and relax. 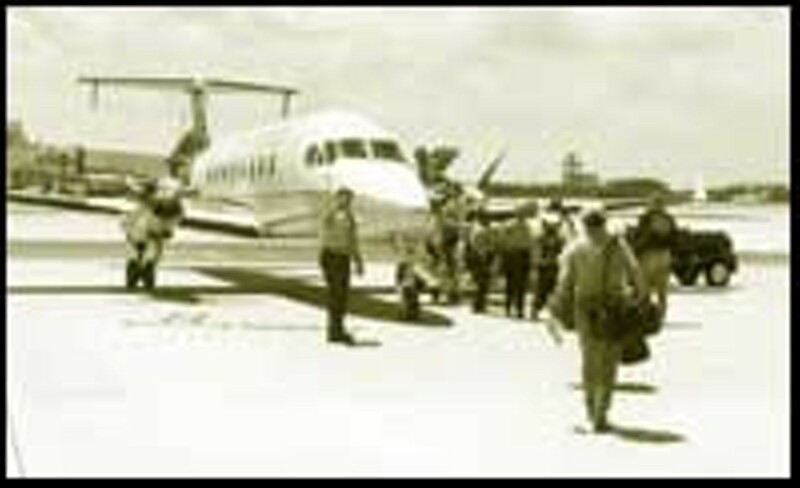 When we finally walked outside and boarded the 18-seater for the Bahamas, it was sunny and in the 80s, and I was wearing my shorts and sandals. The amount of time that had elapsed since sweater and drizzle was a typical night's sleep, but I was beginning to feel the buzz. It was finally dawning on me that I had left home and was on my way to a vacation. I had a little strut in my step as I crossed the tarmac. We took off over the beach -- the other side of the continent -- and in an hour were descending to the landing strip in Marsh Harbour, over clear ocean and under a cloudless sky. I leaned back in my seat, let go of the nervous Easterners, thought of the ocean swim to come, and decided that near- instant travel wasn't such a bad thing after all.